Welcome to Maggie Britton Music! 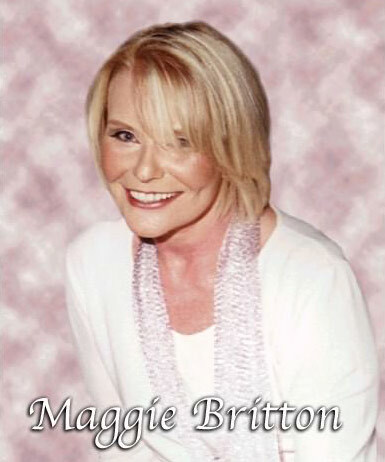 Maggie Britton singer, songwriter and international recording artist with chart success (Top ten) records in the United Kingdom, Belgium, Netherlands, Europe, Australia and New Zealand. An important aspect of Maggie’s professional life is the career development of young singers / songwriters and others aiming for a successful future in the Music / Entertainment Industry and the Media. Maggie shares her ‘knowledge and practical experience in the music industry’, by coaching, co-ordinating and producing projects for Australian and International artists. A detailed prospectus of professional services is available on request. Maggie is, recognized as a music producer, who skilfully and patiently guides both, the artist and the project. The resulting product is commercially viable and achieved within the budget. Production credits include awards for Best Producer 2002 and Best Album 2002 presented by the Recording Industry Association, Queensland. Maggie Britton is a successful, international recording artist with chart (Top ten) records in the United Kingdom, Europe, Australia and New Zealand. Maggie’s song writing talent, vocal expertise and dynamic live performances have taken her throughout Australia and around the world. From the beginning of her career as a regular performer on Brian Henderson’s Bandstand (Channel 9, Sydney Australia) Maggie toured extensively throughout Australia and New Zealand. Her first record ‘Come On Down’ written by Jackie De Shannon reached number one on the New Zealand chart and remained in the top ten for twelve weeks. Several more chart successes followed including ‘Morning Dew’ and ‘Stop’. Maggie then signed to the major U.S. film and Recording Company United Artists to record in the USA. Her first single, released on United Artists, ‘Reuben James’ written by Alex Harvey was also her first hit in the United Kingdom and other European countries and has become a country music classic covered by many other well known artists. The Bee Gee’s, Robin Gibb, Peter Sellers, Kenny Rogers, Glen Campbell, Mama’s and Papa’s, The Temptations and the Three Degrees (Prince Charles’ favourite group) and the evergreen Max Bygraves, to mention a few. ‘Bandstand’s Singing Sweethearts’ Festival/Mushroom Spin March 2001. Includes two of Maggie’s hit singles ‘Morning Dew’ and ‘I’m Into Looking For Someone To Love Me’ Available through all Record outlets. Leigh Sleightholme – International Touring Company ‘We Will Rock You’ 2005 (Singer/Songwriter/Musician/Dancer/Actor) ‘Mumma Mia’ National tour. Currently group member of ‘Boys in the Band’ touring. ‘From The Desert To The Sea’ award winning CD album 2002, artist Jason Lee Scott. ‘Open Your Heart’&‘Drive Me Crazy’ released June 2002 artist Fumitaka Fuchigami. New Zealander Leesa Harpur, Actress (Zena Warrior Princess) and Singer (3 tracks on CD Album) (Auckland) (Through Universal Music) Release date Jan 02. 2000 From 1995 until 2000, Maggie was Co-Director of the South Pacific International Song Contest Pty Ltd. The company was responsible for staging the prestigious South Pacific International Music Awards, a pre-release awards event and hit predictor show casing the best young talent from the world’s music industry, taking place annually and involving a variety of events presented over a five day period. ‘Meet the Stars’ presented in a cabaret setting was much enjoyed particularly by those members of the public who got the opportunity to meet in person and speak with stars from their country of origin. ‘Mayoral Cocktail Party’, attended by Dignitaries, sponsors, special guests and visiting international media, hosted by the Mayor at the Gold Coast City Art Gallery. Dreamworld, Mercure Resorts, Gold Coast City Council, the Australian Performing Rights Association (APRA), the Performing Rights Association (PRS) and the British Academy, British Airways, Festival Mushroom Records along with the South Pacific Trade Commission and others sponsored the event. Former committee member (2002) of the Music Managers Forum (MMF). The (MMF) has some five hundred members who in turn represent the majority of Australian recording artists. The objective of the organisation is to raise the professional standards of music management. The (MMF) undertakes representations to government and others on matters affecting members’ obligations, rights or interests. Maggie is a ‘Full Writer Member’ of the Australian Performing Rights Association (APRA). Member of the Board of Directors, of FIDOF’s, ‘Professional Child Artists Foundation’. Fellow Board members include; Mr Paul Chiaravalle (Walt Disney Productions), Mr David Stark (Songlink International) and Mr Mickey Rooney (Actor). The annual ‘Voice of Asia’ Pop Music Festival. ‘Nile International Children’s Festival’ Egypt. Awarded the ‘Vietnam Logistics and Support Medal’ in 1988 for her tour of duty entertaining the troops at the time of the ‘Tet Offensive’ 1968 during the Vietnam War. The first entertainer invited to join the Vietnam Memorial Association 2004. The memorial is located at the Australian Defence Force training facility, Canungra, Queensland. Maggie has raised many thousands of dollars for Legacy through her Gala concerts. Maggie is an ‘Honorary Lieutenant’ in the Australian Army. In 1981 the Royal Navy (RN), adopted Maggie Britton, the only other recipient of this rare honour being Dame Vera Lynn. The adoption affords Maggie several interesting privileges. Permission to park in the forecourt of Admiralty House, London is one that is very useful and appreciated. Invited to join manoeuvres with the fleet in the English Channel aboard HMS Arrow and transferring via breeches buoy under full steam to HMS Norfolk remains a treasured experience for Maggie. ‘The Angels Kitchen’ (Southport) – Serving free meals to people in need. The Thai Burma Railway Expedition 2005 under the Patronage of His Excellency Major General Michael Jeffery AC, CVO, MC Governor General of the Commonwealth of Australia. This project was part of the official commemoration of the 60th Anniversary of the end of WW11 (15th August 1945). The aim of the project was for an Australian team to walk from Changi Prison Chapel, Singapore retracing the route of the Death Railway through Thailand to the Burma/Myanmar border. To commemorate and in remembrance of those POW’s who were taken as forced labour to work on the construction of the Thai / Burma Death Railway in 1942 – 1943. The project required adherence to strict protocols in dealing with the offices of the Governor General, the Premier’s Department, the Department of Veteran Affairs (DVA), Australian Defence Forces, Embassies, Sponsors, Ex POW and other official bodies. The official launch by the Premier of Queensland, the Hon. Peter Beattie MP Premier and Minister for Trade. Afternoon tea at Parliament House Brisbane, 14th July 2005 attended by sponsors, Ex POW’s and print and electronic media representatives. Official farewell by Maj-Gen Michael Hindmarsh, AM, CSC (SOCAUST) at Changi Memorial Chapel, Royal Military College Duntroon, ACT on the 3rd August, 2005. Maj-Gen William Crewes AO, RSL National President. Brigadier Chris Appleton, Commandant Royal Military College of Australia Duntroon. (All channels) television news, all local radio and press in attendance. Changi Prison (15th August) as above. Kanchanaburi Commonwealth War Graves Memorial Service with Ex POW’s. 25th August 2005. Hellfire Pass Memorial Remembrance Service 26th August 2005 coordinated with the Department of Veteran Affairs. Members of the walking team and their families. Australian and international television news media. Australian and international print media. Scheduling of Radio and television interviews with team members. Oversaw the design and construction of a state of the art website www.ourheroes.com.au created to facilitate live interaction between the wider international communities, including schools, tertiary institutions and the expedition team. Responsible for the negotiation of joint media coverage between Strut Media / Network Ten News / Courier Mail / Telstra and the expedition team. This involved writing of proposals, presentation, negotiation and follow up.